Pipes over 300mm in diameter are usually connected using dedicated size fittings designed for that exact diameter of pipe. The wide tolerance type of fittings often used on smaller pipes are not normally available in larger sizes for reasons of cost and complexity. Dedicated size fittings are sometimes also used on smaller diameter pipe installation projects if a large number of them are to be used on a single project. 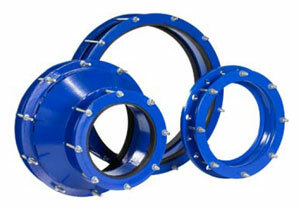 These fittings are often manufactured to order for a specific job. Please contact our sales office with details of the pipe diameter and working pressure.